The little town of Fatima only counts 10,000 inhabitants. It became famous worldwide after the Virgin Mary's apparition and several miracles. Almost 1 out of 6 Portuguese people go to the shrine of Our Lady of Fatima. The Blessed Virgin Mary appeared on the 13th of May 1917 to three young shepherds. She asked them to embrace God to bear all the suffering they could go through. She also made them promise they would come on the 13th of each month to reveal them a secret. The messages delivered by the Fatima virgin were publicly revealed to the public on several occasions. The last one is only known since the year 2000. These messages mainly mention the themes of permanent conversion, praying, rosary, and the sense of collective responsibility. During the last apparition, on the 13th of October 1917, a miracle happened in front of almost 60,000 people present on the site of the apparitions, the Cova: the sun quickly came towards the Earth giving the illusion that is was going to crash. This phenomenon, which was also seen kilometres away from Fatima never found a scientific explanation. The three young shepherds died a few years later, just as the Fatima Virgin had announced it. 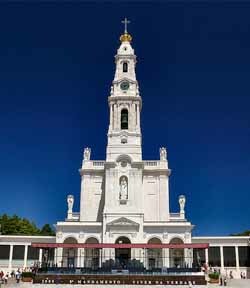 For more information about your pilgrimage in Fatima, please visit the website of the shrines. Your contact in Fatima is Mr Frazào.